Wolf Creek, Follow The Money, and Ripper Street are among the TV highlights recommended today. The team at Mediaweek offer daily TV viewing highlights. Today’s suggestions come from Andrew Mercado (AM) and Dan Barrett (DB). 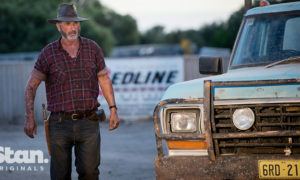 Based on Greg McLean’s film series of the same name, the Wolf Creek TV series again features John Jarratt as Mick Taylor, the savage murderer preying on innocents in the outback. The series shifts the genre of Wolf Creek into a revenge storyline, with Lucy Fry starring as a young girl seeking vengeance after Taylor murders her family. All six episodes of Stan’s original production launch on the service today. Spike Lee’s sophomore film has him starring alongside Danny Aiello, Ossie Davis, Ruby Dee, Richard Edson, Giancarlo Esposito, Bill Nunn, John Turturro, and Samuel L. Jackson. It is also the film debut of Martin Lawrence and Rosie Perez. The film was almost universally received by critics in 1989 and often ranks on lists of the greatest films of all time, but is rarely ever seen on Australian TV.